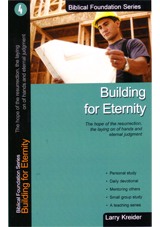 In this fourth Biblical Foundation book, Building For Eternity, we look at the final three of the six foundational doctrines of the Christian faith found in Hebrews 6:1-2—the laying on of hands, the resurrection of the dead and eternal judgment: Therefore, leaving the discussion of the elementary principles of Christ, let us go on to perfection, not laying again the foundation of repentance from dead works and of faith toward God, of the doctrine of baptisms, of laying on of hands, of resurrection of the dead, and of eternal judgment (NKJ). The foundational doctrine of the laying on of hands is an act in which one person imparts or conveys blessing, healing and/or authority to another for a specific spiritual purpose. We will learn that the laying on of hands has a vital connection with many aspects of our Christian lives. The hope of the resurrection is another biblical foundation that is so important to a Christian’s faith because those who believe in Christ will share in His resurrection and have eternal life! Another foundation stone that is linked to the resurrection of the dead is eternal judgment. Every man and woman who has ever lived will be judged by God for all of eternity. The reality of an eternal judgment should cause all believers to hate sin and diligently seek the lost to tell them of God’s wonderful plan for mankind!